Cardinal Environmental is the firm other firms call when things get “dicey”! Cardinal was contacted by J. Brian Day Co. to provide abatement to a water loss they were handling in Attleboro, MA. 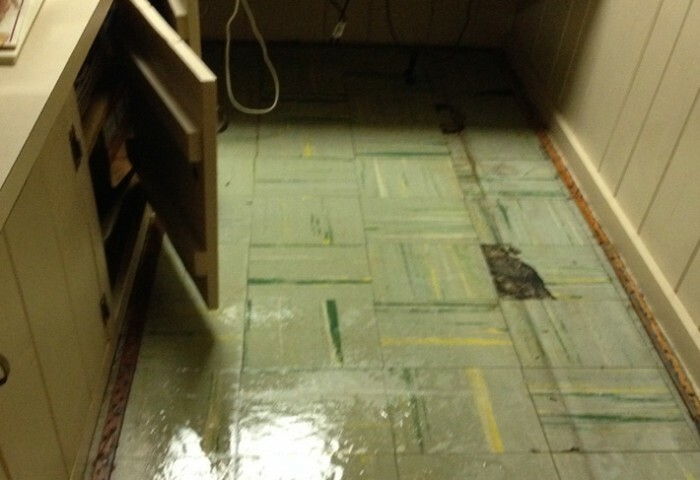 Removing the wet carpeting, exposed crumbling asbestos containing floor tiles that had to be removed before water mitigation could resume. Cardinal Environmental worked directly with the homeowner for scheduling the work. The project was started and completed over the weekend as not to interfere with her work schedule. The homeowner was very concerned about asbestos in her home. Once containment was completed and prior to abatement we walked her through the process explaining the protocols that would be employed. We assured her that she had nothing to worry about. She informed us that after the walk through, she was much more comfortable with the situation and thanked us for the time we took to inform her prior to proceeding with the abatement. Cardinal understands that to be truely comfortable in your home is both physical and emotional, and we deliver on both.